I’ve always been on a quest for the ideal digital camera. As technology keeps advancing, that’s a moving target of course, and it’s what keeps camera manufacturers in business. But over the last few years, I’ve been putting my ideas about what makes the perfect digicam in some kind of order. For me it turns out to be all about portability, so in this series of posts, I’ll document for my information, and possibly yours, what I have learned so far. There is an adage, almost as old as photography itself, that “the best camera is the one in your hand”. I had always thought by the way that the source of this quote was Robert Capa, who was the originator of some wonderful lines, including “If your pictures aren’t good enough, you aren’t close enough”, and “It’s not enough to have talent, you also have to be Hungarian” (if you haven’t read it, take a moment to check out my post about the brilliant Hungarian photographers of the mid-20th century). Sadly it wasn’t Capa who made the original quote. In fact I cannot attribute it to any of the photography greats. In the context of many of them, the quote is not even true as they often lugged massive arrays of heavy equipment around with them to get the best shots. But for me, portability is the defining element of the usefulness of a camera (and possibly what marks me as an amateur). On treks I have seen people with camera kit so massive they needed a separate porter to carry it. And while they may have got some great photographs, the act of taking them really seemed to interfere with the simplicity of the trek itself. Similarly, on the street, unless you have a bona-fide pressman air about you, the wearing of a 35mm DSLR around your neck can often say ‘prat’ in a profound and public way. But what is the meaning of ‘portable’ in a camera? For me, it is ‘practicably and unobtrusively wearable’. 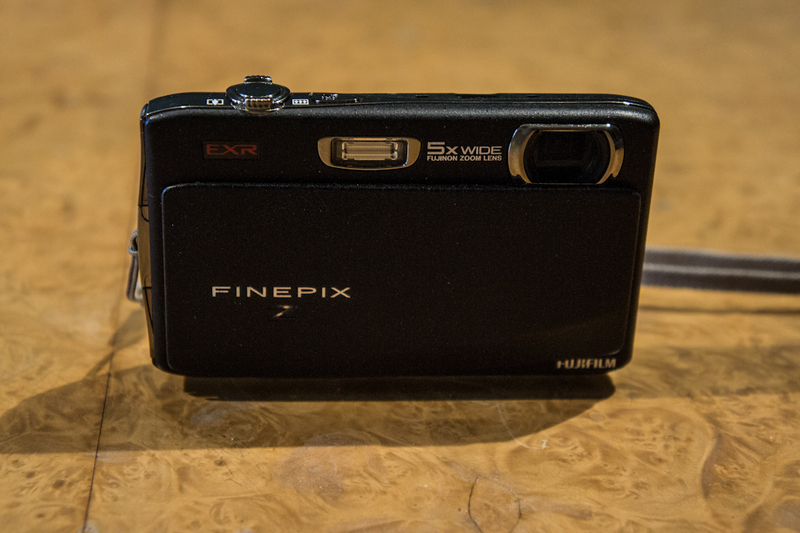 In my opinion there is no serious camera that can be practically kept all day in a trouser pocket without great discomfort, and free from damage from keys, coins etc. So it must either be portable on my waist, or in a shoulder bag. At the time of writing (April 2012) I am using 5 cameras, and in the shot below, here they all are laid out in order of portability. 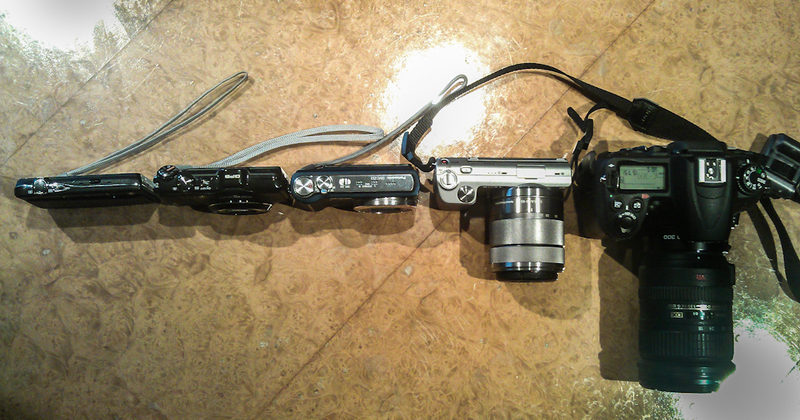 From left to right, they are, Fuji Z900 EXR, Fuji F600 EXR, Panasonic ZS-3, Sony Nex-5, and Nikon D7000. As you can see, they range from the (almost) pocketable, to the very large. More telling is how wide they are, as this determines how far they stick out if you have them on a belt clip, or how big a bag you need. So here’s a view from the top. This top-down shot starts to show how practical some cameras are for carrying around compared to others. I bought the Sony because it has a very large sensor (24x16mm, the same size as the Nikon, and 12x the area of the Fujis), but a very compact body. However the geometry of the optics means that a zoom lens has to be much deeper (to be able to focus) than the smaller cameras. The 3x zoom on the Sony extends nearly 4 inches out, compared to the 5x zoom on the little Fuji, and the 15x zoom of its bigger brother. 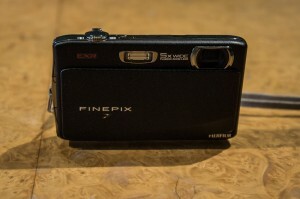 As a result the Sony Nex-5 is only borderline practical for walking around. The Nikon is completely impractical, as I will describe later. Finally, every camera needs to be in a protective case in the real world. The two elements of the case are: how big is it, and how easy is it to quickly extract the camera to take a shot? Oddly the ideal of the smallest possible protective case, combined with the easiest possible removal of the camera is something that most vendors completely miss. I’ve had to look quite hard, and in each case below, I think I have the best case that meets my criteria. Here’s how they look from above. I have included a bottle of Tesco full cream milk for a size comparison. This is where the size differences really start to show. The two Fujis are completely viable for traveling and walking around. The Panasonic (in the middle) is just usable. I have taken it on many treks and it worked fine along all with the other encumbrances, but in the street in London, it is just a wee bit too big and obvious for me. The Sony can only be carried round the neck, which might work but the custom Sony case is quite ridiculous, leaving you with bits of the thing to remove and somehow store while taking a shot. And the Nikon case is only really sensible as a compact protective cover to move the camera from one static position to another. Now this of course is only my view. Pros and keen amateurs think nothing of having not just one but several camera round their necks, often with additional lenses also. I have tried this, but it doesn’t work for me, and I feel with technology where it is, it should not be necessary. Each camera has its individual merits, and I use all the models shown above – but I use the two Fujis the most because of their size. Now the key question for me is – what are the merits of the different cameras and sizes, and specifically – what do you lose by having a sensor that is less than 10% of the size of the two high-end systems? And why Fujis? All will be explained in the next two posts, the first of which will give a short overview of each camera, and the second of which will deal with some specific testing of the effect of the sensor size on picture resolution.